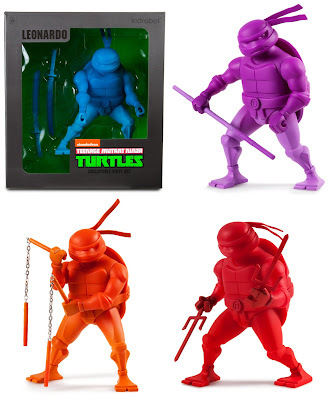 Today Kidrobot has released these awesome stylized monochromatic Teenage Mutant Ninja Turtles medium vinyl figures! You know, it’s been a really long time since Kidrobot has produced a really cool licensed designer art toy, and The Blot is seriously loving these TMNT figures. I love KR’s unique take on Leonardo, Donatello, Michelangelo and Raphael. Each totally tubular Ninja Turtles figure stands 8” tall and was produced in a monochromatic unpainted vinyl corresponding to the character’s signature mask color. 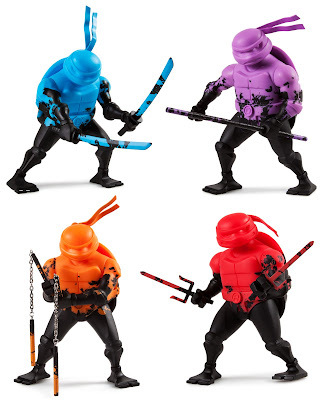 All four turtles include their trademark weapon, come striking a battle pose and feature three points of articulation (head and arms). Collectors can pre-order all four figures now at Entertainment Earth for $39.99 each here. But that's not all! Kidrobot has also released a Kidrobot.com exclusive colorway of each turtle, which features a really sick fade to black paint job. These KR exclusives are limited to just 250 pieces each.